The most sought after attraction in búzios is of course the same as the world over, great beaches and Búzios being a peninsula offers many of them. 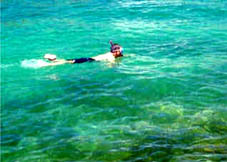 Calm water beaches for diving, surf beaches, warm water beaches or cool ..all sure to meet various taste and interests. 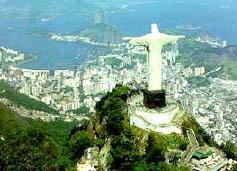 Among other activities there are city tours available that take visitors to the marvelous city of Rio de Janeiro as well as the lovely colonial towns of Cabo Frio and Arraial do Cabo. You can go on an eco adventure tour to the mountain town of Sana where the waterfalls and mineral springs pop up everywhere and then of course you cant miss the tour of Buzios. One of the most sought after tours are the schooner boat trips. 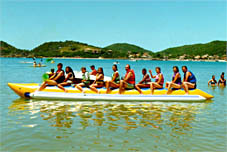 The schooner trips are safe, comfortable and planned for you to enjoy up to 15 of Buzios beaches. you may choose to swim, dive or just enjoy the food and drinks on the beach. 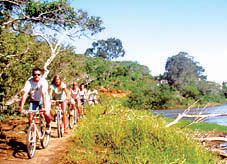 For mountain bike lovers in Buzios there are numerous trails in the middle of the Mata Atlantica forest, full of orquids, bromeliad, colorful butterflies, exotic birds, and even rare and endangered gold faced lion monkey. 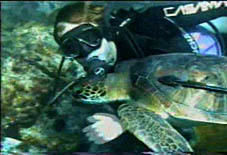 Near the lagoons and ocean there are guided tours. For those with a spirit of adventure but lacking a bit of stamina, there are all terrain vehicle rentals that take you to unforgettable places. 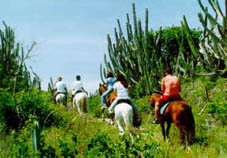 There is also horseback riding for the ones that prefer a more quiet adventure. Existem Também passeios guiados a cavalo, ou então o aluguel dos mesmos para os que querem curtir a natureza em todos os sentidos, sem o agito da pedalada e sem o barulho dos motores, apenas o belo som que a natureza nos regala. 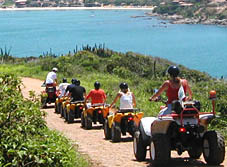 Na praia do Canto, no Centro da cidade se tem acesso a aluguel de Jet-ski para os que gostam de emoções fortes. 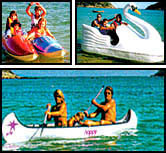 Kayaks as well as water bikes are also available at the majority of the beaches and who knows you may just bump into some dolphins jumping near you while you’re out in the water pedaling or rowing away near Armacao beach. The peninsula is particularly appropriate for sailing. The sea breeze help the temperature remain at a comfortable 40 degrees in the summer time. 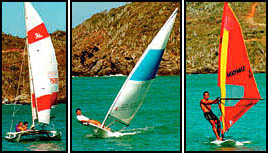 This fact helped to make Buzios home to the world sailing championship. 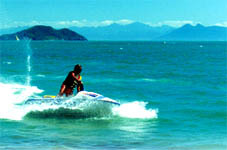 There are many windsurf schools at the various beaches where one can rent equipment. Buzios also is home to a world class golf course where many tournaments are held, but don’t worry you wont have to carry your heavy golf bag. 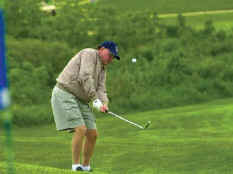 Buzios golf course rents equipment also. As at the beaches, the night life of Buzios is full of song and dance …you can dance to the Brazilian beat as well as international tunes. 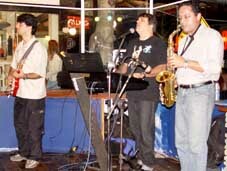 Buzios is also the home of various jazz and blues festivals. 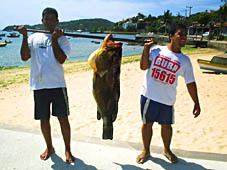 For the sport fishing enthusiastic the waters of the peninsula offer a variety of game with names like anchova, pargo, badejo, peixe espada , bonito, sardines and other numerous varieties. The city has boats and tackle stores where you can buy equipment and rent a boat. Aside from all the fish species mentioned above that are special for culinary delights, there is also the multitude of colorful coral fish that can be seen by snorkeling or thru a diving course available in town. Buzios has a ramp for hand gliding off the Emerencias Mountain located between the beaches of Tucuns and Ze Goncalves where one of Buzios most beautiful view can be appreciated. 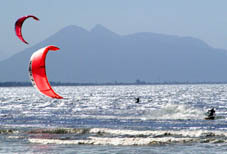 Kite surfing lessons are also available in Buzios a favorite sport in Buzios since the sea breezes chase the clouds away, creating ultimate conditions for this activity. 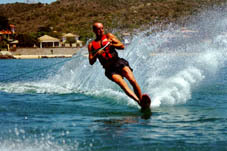 There are in some of the beaches, conditions and rentals for water skiing. A fun and easy choice. Banana boats are fun for the whole family. Na cidade se encontram espalhadas muitas praças com campos de futebol socite, futebol de areia y futebol profissional de livre acesso. Há também na cidade uma pista de Skate para os mais radicais, ou para os que simplesmente querem ver um lindo espetáculo de skate ou de Bike dos garotos visinhos a pista que se encontra no bairro de Geribá-Ferradurinha, é de livre acesso.